Hilton is headquartered in Tysons Corner, Virginia. As of September 2018, its portfolio includes more than 5,500 properties (including timeshare properties) with over 894,000 rooms in 109 countries and territories. Prior to their December 2013 IPO, Hilton was ranked as the 36th largest privately held company in the United States by Forbes. Hilton has 15 brands across different market segments, including Conrad Hotels & Resorts, Canopy by Hilton, Curio – A Collection by Hilton, Hilton Hotels & Resorts, DoubleTree by Hilton, Embassy Suites Hotels, Hilton Garden Inn, Hampton by Hilton, Homewood Suites by Hilton, Home2 Suites by Hilton, Hilton Grand Vacations, Waldorf Astoria Hotels & Resorts, Tru by Hilton, Tapestry Collection by Hilton, and Motto by Hilton. On December 12, 2013, Hilton again became a public company, raising an estimated $2.35 billion in its second IPO. At the time, The Blackstone Group held a 45.8 percent stake in the company. In October 2016, HNA Group agreed to acquire a 25 percent equity interest in Hilton from Blackstone. The transaction was expected to close in the first quarter of 2017. 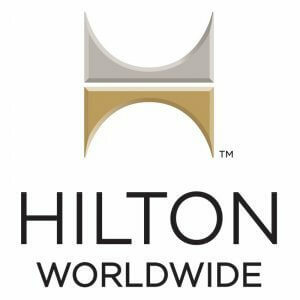 Hilton’s largest stockholders are HNA Group, Blackstone, and Wellington Management Group, which own 25%, 15.2%, and 6.7% of Hilton common stock respectively. Hilton was founded by Conrad Hilton in Cisco, Texas, in 1919 and had its headquarters in Beverly Hills, California, from 1969 until 2009. In August 2009, the company moved to Tysons Corner, unincorporated Fairfax County, Virginia, near McLean.